If you, your spouse, or your dependent child sustain any of the losses below while occupying a common carrier, or while at the airport, terminal or station at the beginning/end of your trip, you are eligible for the corresponding benefit amount. Note: Benefits are payable when an insured person has been totally and permanently disabled for 365 consecutive days. Call Scotia Assist at 1-877-391-7507 immediately or as soon as reasonably possible. If possible, notice should be given within 90 days of the loss occurring. Call Scotia Assist immediately at 1-877-391-7507 but no later than 90 days from the date of the loss or theft to obtain a claim form. The claim form must be completed and sent back within 1 year in order for benefits to be paid. This plan automatically insures most new items purchased anywhere in the world for 90 days from the date of purchase. If the item is lost, stolen or damaged, you will be reimbursed for the lesser of the repair or replacement cost. Only items that were paid for in full with your Scotiabank Gold American Express Card and/or paid with Scotia Rewards points are covered by this plan. Note: There is a maximum lifetime liability of $60,000 under the purchase security and extended warranty coverages. Call Scotia Assist at 1-877-391-7507 as soon as reasonably possible, but no later than 90 days from the date of the loss or damage, to obtain a claim form. You must contact Scotia Assist before proceeding with any action or repairs. Note: If the claim is for a gift, it must be made by the account holder, not the recipient. This insurance plan either doubles the length of the item’s manufacturer’s warranty coverage or extends it by 1 year—whichever is lesser. Only items that were paid for in full with your Scotiabank Gold American Express Card and/or paid with Scotia Rewards points are covered by this plan. Benefits are limited to the lesser of the cost to repair or the original purchase price charged to the account. This coverage applies automatically to items with warranties that are 5 years or less. Items with warranties greater than 5 years must be registered by calling 1-877-391-7507 within 1 year of the date of purchase in order for coverage to apply. You must complete the claim form before proceeding with any repairs. If, before your scheduled departure, you are required to cancel your trip due to a covered cause for cancellation, your eligible expenses are covered up to $2,500 per person and up to $10,000 per trip. You, your spouse and dependent children, as well as one travelling companion are all eligible to receive benefits under this insurance when at least 75% of your eligible expenses are charged to your Scotiabank Gold American Express Card and/or paid with your Scotia Rewards points. Note: Only one travelling companion is covered on each trip. Call Scotia Assist at 1-877-391-7507 within 48 hours of the time the covered cause for cancellation arose to obtain a claim form. Notice and proof of claim must be provided no later than 1 year from the date the claim arises. If within 60 days of the purchase of an eligible item, you find an identical item offered for retail sale at a price lower than the price you paid, you will be paid for the difference in price. 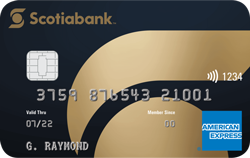 This insurance is available only to the Cardmember and applies only to items purchased in Canada that were paid for in full with your Scotiabank Gold American Express Card. Call 1-877-391-7507 as soon as you notice the price difference. You will be sent a request form which you will need to complete and sign, and send back within 90 days from the date of purchase. Note: If the request for payment of the price difference is for an item that was given as a gift, it must be made by the account holder, not the recipient. If, as a result of one of the covered causes for interruption occurring during your trip, you are prevented from continuing the trip or are unable to return on the original scheduled return date, your eligible expenses are covered up to $2,500 per person and up to $10,000 per trip. Call Scotia Assist at 1-877-391-7507 as soon as a cause for interruption occurs and they will assist you in making the necessary arrangements to return. If your scheduled departure from any airport is delayed by 4 hours or more, you will be reimbursed up to $500 per person for necessary and reasonable expenses on essential and sundry items, meals and refreshments, and hotel accommodations. This coverage applies only to expenses incurred within 48 hours of the delay or denied boarding. In the event of a claim, contact Scotia Assist at 1-877-391-7507 (Canada or US) as soon as reasonably possible but no later than 90 days from the date of the delay, to provide them with a written notice of claim. Note: A dependent child must be travelling either with you and/or your spouse in order to be eligible. Following the end of a medical emergency, or if an insured person is delayed in returning home due to a delay either of a common carrier or of their personal vehicle (accident or mechanical breakdown), then coverage is automatically extended up to 3 days. In the event that your checked luggage, or that of your spouse or dependent child, is stolen or permanently misdirected while in the custody of common carrier, you will be reimbursed up to a maximum of $1,000 per trip. Payment is based on the actual replacement cost of any lost or stolen article, provided the article is actually replaced. Otherwise, payment is based on the actual cash value of the article at the time of loss. Call Scotia Assist at 1-877-391-7507 as soon as reasonably possible, but no later than 90 days from the date of the loss, to obtain a claim form. If your checked baggage, or that of your spouse or dependent child, is not delivered within 4 hours from the time of your arrival at the final destination, you will be reimbursed up to a maximum of $1,000 per trip for the cost of replacing essential items until your luggage arrives. Essential items must be purchased before your checked luggage is returned and no later than 96 hours after you've arrived at the final destination. Note: Coverage applies only when the full price of the passage fare is charged to your Scotiabank Gold American Express Card and/or paid with Scotia Rewards points. Call Scotia Assist at 1-877-391-7507 as soon as reasonably possible, but no later than 90 days from the date of the delay, to obtain a claim form. If, while you are checked in, your personal property is stolen from your hotel/motel room and there is evidence of forceful entry, you will be reimbursed up to $1,000 per person for the stolen property. Note: Coverage applies only when the full cost of the hotel/motel room has been charged to your Scotiabank Gold American Express Card and/or paid with Scotia Rewards points. Call Scotia Assist at 1-877-391-7507 as soon as reasonably possible, but no later than 90 days from the date of the theft, to obtain a claim form.